LAUREL, Md. There are all kinds of test drives, but only one at 52,000 miles per hour. That’s the speed scientists here in Maryland are aiming for and as Alex DeMetrick reports, the test track is Jupiter. Man’s first journey to Pluto left a little over a year ago. But for the New Horizons Spacecraft to get there, it’s difficult. "There’s this little keyhole the spacecraft must reach," Dr. Hal Weaver from the Hopkins Applied Physics Lab said. That little keyhole just happens to be the biggest planet in the solar system. Jupiter is the spacecraft’s turbo charger, guided by controllers at Hopkins Applied Physics Lab in Laurel. "We’re using Jupiter as a catapult. By passing fairly close to Jupiter, it’s going to sling-shot us faster toward Pluto. We’re gaining 9,000 miles per hour," Weaver said. It’s man’s fastest vehicle. While passing by, instruments will be checked out, observations made, including a ride down the planet’s massive magnetic tail. 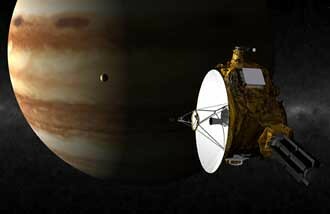 New Horizons will train its instruments on Pluto in a fly-by in 2015. That’s a long time, but scientists hope it will get there thanks to Jupiter’s assistance. Not only will New Horizons provide scientists with their first close look at Pluto, the spacecraft will also continue on into the Kuyper belt in search of other Pluto-type objects. The upcoming early arrival of Daylight Savings Time continues to make some headlines, even if there really isn’t a whole lot to worry about. The latest story looks at how the Los Alamos National Laboratory is coping with the change, and things seem fine, as its IT director is apparently most concerned about people who use calendar programs showing up for meetings on time. The lab’s newsletter, though, had some more pressing advice for employees: make sure things like the clocks on their coffee pots are set correctly, as clearly it would be a significant problem if their coffee wasn’t ready as expected on March 11. Perhaps when we repackage our Y2K preparedness kits and bunkers, we should make sure they include coffee pots that don’t contain a clock. "Anti-jamming technology is already used by military and spy satellites, but proposals to install similar protection in the 250 large satellites in commercial operation have been prompted by the threat of disruption. The successful jamming of video, data, or voice signals by individuals or groups could jeopardise the millions of dollars spent on just a handful of satellites, operators fear. Such jamming of government navigation satellites has already occurred, according to Lieutenant General Robert Kehler of the US Air Force, ‘as has jamming of commercial telecommunications satellites.’"
Space.com has a great background report on Spy Satellites for those who want to know a little bit more about the technology and the American Military and Intelligence communities uses of the technology. While Spy Satellites have been used for quite a long time, even the latest anti-jamming technologies are unable to prevent detection, the spy satellite holy grail. While satellite project, such as MISTY, have been able to avoid detection by laser and microwave radar, none has been able to completely avoid visible detection, a limitation which has prompted the emergence of a small, but strong spy satellite monitoring enthusiast community. Oh, and for those of you who might be worried about the commercial anti-jamming technologies making it into the wrong hands, it looks like your not alone. While Boeing seems confident that they’ll win it, the U.S. government does have to approve the use of the "top secret" anti-jamming technology on commercial satellites before the company can start introducing it on products sold to foreign customers. We all know space debris (or space junk, as I like to call it) is a big problem. While the lost cameras, gloves, and toothbrushes may reenter the atmosphere and burn-up without too much of a problem, the sheer number of spent rocket stages, broken down satellites, and broken off bits and pieces that come along with both pose a real hazards for working satellites, the International Space station, and astronauts on a space-walk. Moreover, the more space junk we create the more we have to watch. Currently, U.S. Strategic Command tracks over 10,000 pieces of space junk to ensure each piece’s reentry is not mistaken for enemy fire from above. Fortunately, according to Aviation Week, the UN is making some headway in the fight against the floating trash, having secured the support of China for a landmark resolution that would set guidelines for limiting space debris. China’s support for the resolution was less than certain, particularly given its recent testing of anti-satellite weapons technology that generated a fair amount of space junk, itself, in the process. Most likely the Chinese may have felt they were safe from scrutiny, because the new guidelines are designed to curtail unintended space debris. "While the Chinese test, which has been described as the worst debris event in space-flight history, was deliberate, the problem of unintended debris generation was underscored this month by the apparent rupture of a fuel tank on a Russian rocket that malfunctioned during a communications-satellite launch last year." Above you’ll find one of the better photos of last year’s explosions that we found on Spaceweather.com. We found at least two other photos on the same site. While it remains to be seen when an actual resolution will emerge from the UN regarding approaches for dealing with the problem of space trash and what (if any) teeth it might have when it’s passed, but its good to hear that someone is making some headway in solving this complicated problem. I’m so glad we have journalists around to make the news interesting. Imagine if we only had press releases. B-O-R-I-N-G ! "…released two new software options to their industry leading product lines that extend their already unique ability to…"
"This flexibility makes the product line more accessible to the networking requirements of government, military, and commercial customers who increasingly value high uplink and downlink speeds at a node and desire to blend terrestrial solutions with their satellite backhaul." "The company’s DVB-RCS/S2 solutions are the only multiple-access satellite solutions capable of delivering data transfer rates of up to 80 Mbps for downloads and up to 8 Mbps for uploads at each remote terminal, or enough bandwidth to support a variety of users such as a small business or battalion unit to an entire community/military base from a single remote terminal." I think it’s time we put some excitement in our "realeases" and start making some real news. I’ve noticed NASA’s public affairs people are putting some fun into their work and coming up with some very creative angles over the past year or so — just take a look at this "Camping on the Moon" release. Brilliant! JAXA used an H-IIA rocket Saturday to successfully place a radar satellite in orbit to complete Japan’s spy system for full global coverage. 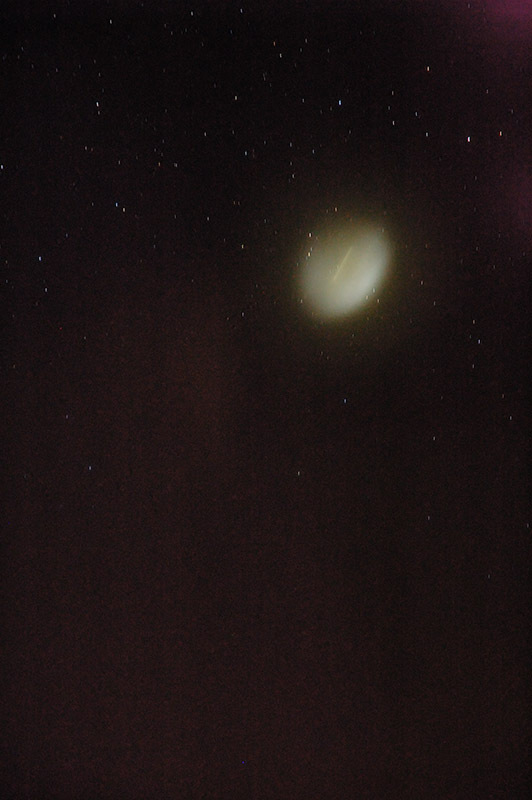 The rocket also carried an experimental optical satellite. Both satellites were placed in orbit about 20 minutes after the 1:40 p.m. launch from the Tanegashima Space Center in Kagoshima Prefecture, the Japan Aerospace Exploration Agency said. They began functioning and their solar-battery panels are open, JAXA said. If the radar satellite continues to perform as planned, Japan’s compliment of four spy satellites will be able to photograph any point on Earth once a day for intelligence-gathering, the agency said. The government decided to launch spy satellites after North Korea fired a Taepodong-1 ballistic missile in 1998, part of which flew over Japan into the Pacific Ocean. Pyongyang maintains it was for sending a satellite into orbit. The launch of the radar satellite enhances a multibillion dollar, decade-old plan for Japan to have round-the-clock surveillance of the secretive North and other areas Japan wants to peer in on. In the spy project, two optical satellites and one radar satellite have already been placed into orbit. But weaknesses in the satellites’ capabilities have led to criticism that the program is a waste of money and, with better data available on the commercial market, that the government will continue to be dependent on Washington for its core intelligence. The launch also comes just a month after China demonstrated its ability to shoot satellites out of orbit with ground-based missiles. Japan and other countries, including the United States, have strongly protested Beijing’s antisatellite test. China has defended the test as peaceful, and said it presents no country with a threat. JAXA officials say the satellites provide an important means for the country to independently collect intelligence, and say improvements in the satellites’ capabilities are in the works. 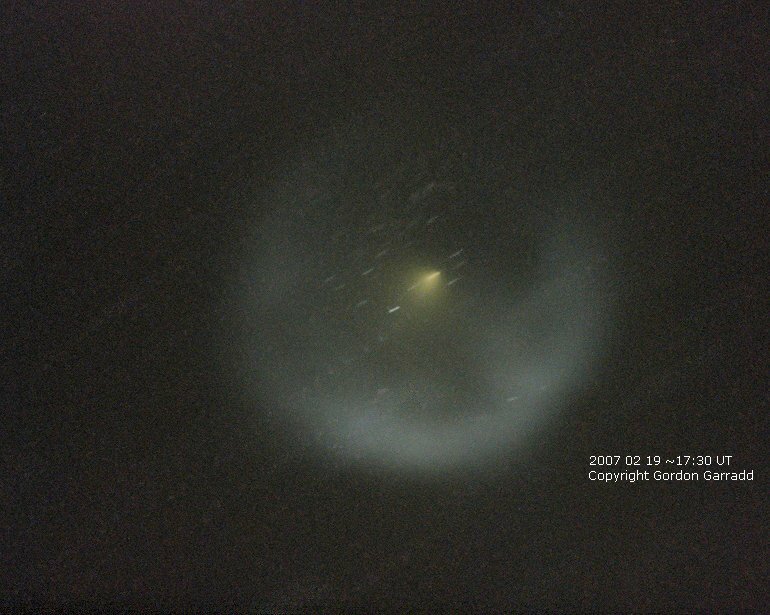 The experimental optical satellite launched Saturday features higher-resolution optics that can be used in the future to improve the quality of orbital photographs taken by Japanese satellites. The two optical satellites already in orbit are reportedly capable of detecting objects about 1 meter in size. The plan is to work toward a satellite capable of detecting objects half that size. 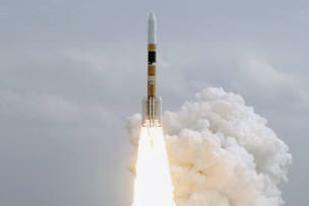 JAXA had originally intended to launch the rocket Feb. 15 but postponed it three times due to thunder and poor weather conditions. There is no greater tool for DIY enthusiasts than the Internet, and today’s DIY activity is just a click away: a sun outage calculator! But wait — what’s a sun outage? Now’s a good time to ask. Sun outage is a natural phenomenon, which occurs twice a year (in the spring and fall) when the sun appears to be passing directly behind the satellite as seen from a receiving earth station. Since the sun is a potent source of radio frequency energy, the earth station’s receivers are overwhelmed by the sun’s “noise” output and reception becomes impossible for a brief period of time, usually less than 10 minutes. An observer at the earth station will notice that the antenna feed’s shadow will fall exactly in the center of the reflector during the peak of the sun outage period. This indicates that the antenna, the satellite and the sun are in direct alignment. At this point in time, the sun’s radio signals are being focused directly into the antenna’s receive feed. This results in a temporary degradation in the signal to noise ratio of the signal being received from the satellite and a consequent degradation in Eb/N0 (Energy per bit over Noise referenced to zero) in digital systems. Sun outage generally occurs between 9 AM and 3 PM for locations in the continental United States. The duration and intensity of the outage will begin as a slight degradation in signal, increasing to a peak level over several days and will then begin to reduce in intensity and duration over a similar period. These outages pose no danger to earth station equipment and they are not related to sunspot activity. So how do you predict when the sun is going to mess up your signal? This sun outage calculator gives you predictions based upon the satellite you’re receiving from, your location on earth, and the time and date. SES also offers a bunch of charts (good luck with that). Intelsat also offers marginally useful maps of sun outages for spacecraft — but they let you input your exact location. I like that. "[The controversy]… centers around four satellites owned by ShinSat, which is a subsidiary of Shin Corp.
Shin Corp was founded by former [Thai] premier Thaksin Shinawatra, whose family sold a 49 percent stake in the company to Singapore investment firm Temasek in January 2006. General Sonthi [Boonyaratglin, who led last September’s coup d’état] said the government should buy back these satellites, which transmit encrypted military communications, in the interest of national security. The estimated price tag is US$294 million." "Thaksin sold it, so he should buy it back for Thailand. Thai people are already paying taxes to the government, so we shouldn’t use the country’s money to buy it from Singapore." The problem for Thailand is, however, that such an oddball move with a foreign company would probably inhibit the future foreign direct investment so crucial to their development. The satellite industry finds itself in a strong position, top executives said at the SATELLITE 2007 opening session, but there was an undercurrent of caution in their comments. There was also a sense of renewed optimism in traditional market segments such as broadcasting with new direct-to-home (DTH) operators springing up throughout the world as well the move to high definition (HD) which is increasing capacity demands. Romain Bausch, CEO of SES Global, said there are strong growth opportunities for satellite manufacturers and launch providers, but admitted the industry “could be in trouble” if companies do not move quickly when attacking new markets and consolidating positions in existing markets. 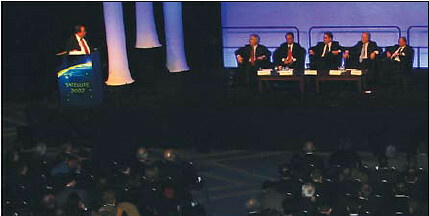 The satellite landscape has changed since these CEOs gathered at SATELLITE 2006. In recent weeks, Eutelsat has announced new shareholders, SES has done a deal with GE to divest certain assets and repurchase stock, Loral and Telesat have hooked up. Unsurprisingly, all the executives painted a bright picture of these moves. Michael Targoff, CEO of Loral Space & Communications, said his company’s acquisition of Telesat was vital for the operator to be a long-term player in the market and would help Loral compete more effectively with the big guns in the industry. Besides competing with the other satellite players, Berretta called for more cooperation within the satellite industry as they look to compete against other infrastructures and operators. Andy Sukawaty, CEO of Inmarsat and the lone Mobile Satellite Services (MSS) representative, told the session that some of the plans being offered by the low-Earth orbit (LEO) operators are “deeply flawed”. However, Sukawaty was optimistic about his own company’s growth prospects. While price erosion on the voice side means revenue growth is difficult despite volume growth, data applications could be the key to a successful future for the operator. “Historically, we have had targeted a 3 percent growth rate, but now we want to accelerate that to 6 [percent] to 8 percent growth,” he said. “That will be driven by data applications. Data applications will provide double digit growth. The question is who captures that double-digit growth."